LONDON – Millions of UK workers are set to find a pleasant surprise in their letter box in the coming months, as the HM Revenue and Customs begins a new campaign to reconcile tax overpayments made by taxpayers over the last 8 years. On October 19th the UK HM Revenue and Customs (HMRC) announced that it is set to issue a multitude of tax refunds in order to cover overpayment of individual tax liabilities dating back as far as 2003. The tax refunds are a result of discrepancies discovered in taxpayers’ PAYE tax obligations. Approximately 6 million individuals are set receive a refund, with an average payment of GBP 400. The HMRC estimates that a total of GBP 2.5 billion will be paid back to taxpayers. Alongside the repayments the HMRC will also issue bills to 1.2 million taxpayers for newly discovered tax underpayments. The average bill is expected to be approximately GBP 600, with an estimated total of GBP 720 million. The payment reconciliation come as a result of an investigation conducted by the HMRC earlier in the year, which used a new IT system to uncover previous mistakes in tax records and cross check tax payments for overlooked errors. The HMRC has been subject to ongoing criticism for a series of problems which had been found with the PAYE processing system. However the tax authority insists that the latest round of refunds is not evidence of “a blunder” but a concentrated effort to clear a backlog of minor inconsistencies. Taxpayers who are receiving a tax refund or a bill for underpayments will be given the option of adjusting their tax code in order to spread the reconciliation over a longer period of time. 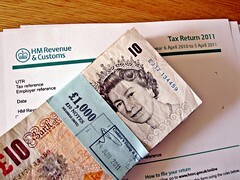 The HMRC hopes to complete the tax settle the matter with all taxpayers by December 2012.